The Serbs-guilty-Kosovars-innocent narrative pushed by the interventionists has stuck to this day, in spite of the ongoing victimization of the remaining Serbs – who have been ethnically cleansed from most of the region, after witnessing their homes and churches burned to the ground while the “allies” – who still occupy Kosovo – stood by and watched. As it turned out, NATO did more than merely stand by and watch – according to Marty they actively covered up numerous war crimes committed by the KLA and the current leadership of Kosovo, including the practice of trafficking in human organs torn from the bodies of Serb prisoners of war. The prosecutors office received information which UNMIK officials had received from a team of trustworthy journalists that during the summer months of 1999 Kosovan Albanians had transported 300 kidnapped people from Kosovo to Albania. These prisoners were initially held in sheds and other structures in Kukes and Tropoje [Harry’s note - north-eastern Albania]. According to the journalists’ sources, who were only identified as Kosovo Albanians, some of the younger and fitter prisoners were visited by doctors and were never hit. They were transferred to other detention camps in Burrel and the neighbouring area, one of which was a barracks behind a yellow house 20 km behind the town. One room inside this yellow house, the journalists said, was kitted out as a makeshift operating theatre, and it was here that surgeons transplanted the organs of prisoners. These organs, according to the sources, were then sent to Rinas airport, Tirana, to be sent to surgical clinics abroad to be transplanted to paying patients. One of the informers had personally carried out a shipment to the airport. The victims, deprived of a kidney, were then locked up again, inside the barracks, until the moment they were killed for other vital organs. In this way, the other prisoners in the barracks were aware of the fate that awaited them, and according to the source, pleaded, terrified to be killed immediately. Among the prisoners who were taken to these barracks were women from Kosovo, Albania, Russia and other Slavic countries. Two of the source said that they helped to bury the corpses of the dead around the yellow house and in a neighbouring cemetery. La cyber guerre inclue-t-elle l’élimination physique des cyber guerriers ? ... the last thing that is needed is the suggestion that the line between physical attacks – including Iran-backed terrorist attacks – and cyber-attacks should be so easily blurred. L’armée a utilisé et tiré profit des rapports d’Amnesty pour justifier les attaques et massacres de Rabaa Al Adawiya. Une congestion charge , comme le péage urbain introduit en 2005 pour Londres. Et dont il faudra revoir la traduction dans le cas d’espèce. Spain was also warned by the EU that any move to impose a tax at the border would be deemed “illegal” after Madrid said a 50 euro frontier levy and a ban on Gibraltar aviation traffic from using Spanish airspace were measures under consideration. 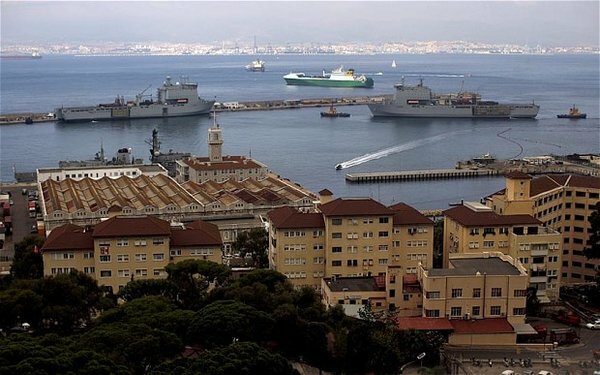 Instead Spain may get around a direct ban on border tax by imposing a London style “congestion charge” on frontier traffic in La Linea de la Concepcion because it would fall within current EU legislation. What has Ed Miliband, the Labour Party’s great hope for 2015, said about Spain’s mounting attempts to intimidate the people of Gibraltar? Absolutely nothing. The Gibraltar issue has further underscored Ed Miliband’s shortcomings as a leader, both at home and abroad. His failure to support the inhabitants of Gibraltar and their right to self-determination is disturbing, and raises serious questions over the future of British policy on both Gibraltar and the Falklands should he become prime minister. The Gibraltar government says the concrete reef in the Bay of Gibraltar will regenerate marine life and argues that the Spanish raked for shellfish there illegally in its waters. Et que la riposte espagnole risque d’être une vertueuse #écotaxe. Los activistas advirtieron en julio al Ministerio Público de que se habían extraído toneladas de ese material del espacio protegido para venderlo en la Roca y usarlo con un fin: «Regenerar playas ganadas al mar en la cara este del Peñón». Para evitar este tipo de situaciones, el Ministerio del Interior, en coordinación con la Fiscalía de Medio Ambiente y Aduanas, dio ayer a la Guardia Civil la instrucción de prohibir que camiones cargados de arena procedentes de España atraviesen la Verja. 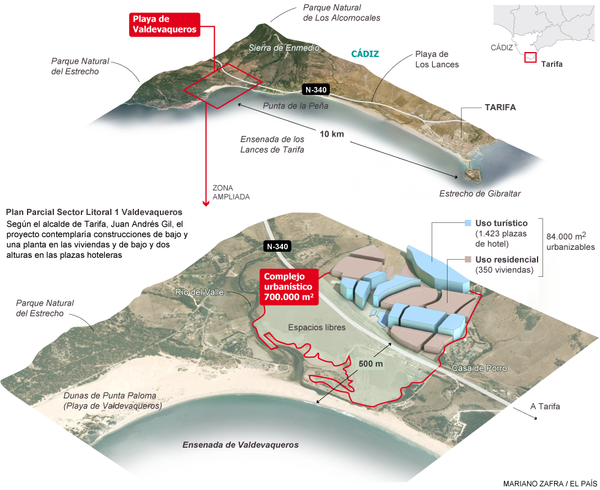 The Junta put the legislation in place earlier this month after thousands attended demonstrations on the beach to protect Valdevaqueros from a construction project that threatened to ruin its nature and beauty. 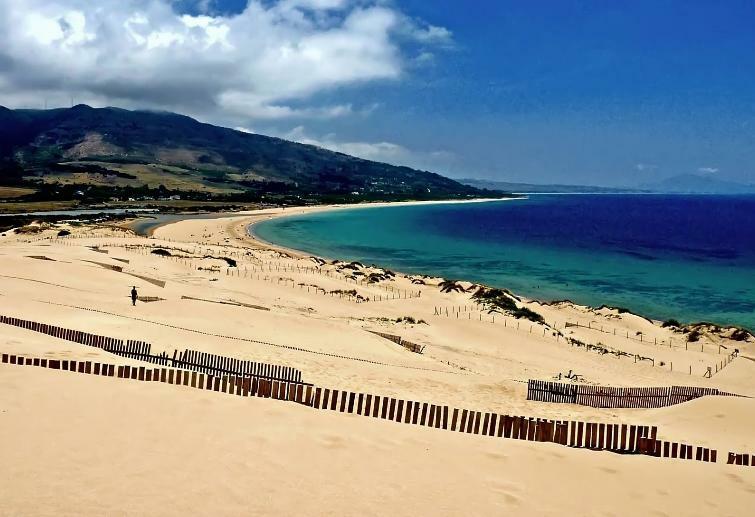 The Tarifa town hall had planned to build a 1,400-room hotel and 350 additional properties next to the beach. Garcia, extremely unhappy with the halted construction, stresses the importance of new hotels and properties to the area’s economy. Ça a quand même une autre gueule qu’un bête cordon littoral ! Todo esto se debe a la ¡oferta especial! del alcalde de Tarifa, Juan Andrés Gil, que ofrece la duna, hasta el punto de que está dispuesto a regalarla a todas las playas de España, según afirmó en la última reunión de la Junta Rectora del Parque Natural del Estrecho. La zona de Punta Paloma, en Tarifa (Cádiz), ha vuelto a verse afectada por el avance de la duna de Valdevaqueros. El temporal de Levante que agita la zona del Estrecho trasladó la arena. Esto obligó al uso de maquinaria para extraer arena en la carretera de acceso a Punta Paloma. Medio millar de turistas y vecinos de la zona de Punta Paloma permanecieron incomunicados gran parte de un día el pasado agosto debido al avance de la duna de Valdevaqueros. Article du 24/03/12 qui rapporte le blocage de 500 touristes une journée du mois d’août (2011). Shafilea Ahmed’s parents have been found guilty of her murder. The beautiful 17-year-old Cheshire schoolgirl was killed by her own mother and father in a brutal honour killing they kept hidden for nine years. Si la nouvelle est confirmée - ce qui serait le cas, puisqu’il y a eut procès -, je partagerais l’avis, le sentiment de la journaliste. Rebel sources in Hatay told me last night that not only is Turkey supplying light arms to select battalion commanders, it is also training Syrians in Istanbul. Men from the unit I was embedded with were vetted and called up by Turkish intelligence in the last few days and large consignments of AK-47s are being delivered by the Turkish military to the Syrian-Turkish border. 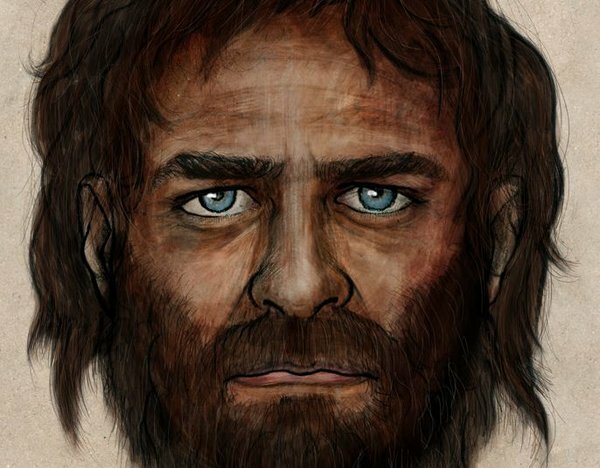 No one knows where the guns came from originally, but no one much cares. This news, which has provided a much-needed morale boost to Syria’s embattled opposition, does appear to corroborate a recent report by the Washington Post that the United States has been facilitating the transfer of Gulf-purchased weapons to the rebels. Étudiant, pas d’antécédents: six mois fermes pour avoir volé pour 3,5 livres de bouteilles d’eau. At Camberwell Green magistrates, Nicholas Robinson, 23, an electrical engineering student with no previous convictions, was jailed for the maximum permitted six months after pleading guilty to stealing bottles of water worth £3.50 from Lidl in Brixton. He had been walking back from his girlfriend’s house in the early hours of Monday morning when he saw the store being looted, his lawyer said, and had taken the opportunity to go in and help himself to a case of water because he was thirsty. He was caught up in the moment, and was ashamed of his actions, his defence said. A total of 333 people have died in or following police custody over the past 11 years, but no officer has ever been successfully prosecuted, according to a watchdog’s report. A great deal has been made over the past few days of the greed of the rioters for consumer goods, not least by Rotherham MP Denis MacShane who accurately remarked, “What the looters wanted was for a few minutes to enter the world of Sloane Street consumption.” This from a man who notoriously claimed £5,900 for eight laptops. Of course, as an MP he obtained these laptops legally through his expenses. Yesterday, the veteran Labour MP Gerald Kaufman asked the Prime Minister to consider how these rioters can be “reclaimed” by society. Yes, this is indeed the same Gerald Kaufman who submitted a claim for three months’ expenses totalling £14,301.60, which included £8,865 for a Bang & Olufsen television. Or take the Salford MP Hazel Blears, who has been loudly calling for draconian action against the looters. I find it very hard to make any kind of ethical distinction between Blears’s expense cheating and tax avoidance, and the straight robbery carried out by the looters. Witches can and should be converted to Catholicism, according to a robust new booklet from the Catholic Truth Society that portrays spell-casting as spiritually empty, exhausting and immoral. Instead of “seeking to change God’s mind or violently alter his plans through circle-casting”, it says, Wiccans should be encouraged to surrender this often frightening burden and accept the love of Christ.